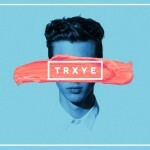 Sivan releases TRXYE. The EP features his single Happy Little Pill as well as four additional songs, and is a collaboration with producers Tat Tong, SLUMS, and Alex JL Hiew. For me, I’ve seen around a lot on the internet people censoring swear words with an ‘x’ or an asterisk. It was just an interesting concept to me. I felt the words looked really, really cool as well. It was visually striking.